An artist's illustration of two merging neutron stars — an event that was observed for the first time in August 2017. This year's Breakthrough Prize has a nice, spacey flavor. British astrophysicist Jocelyn Bell Burnell nabbed a $3 million Special Breakthrough Prize in Fundamental Physics, as we learned last month. Bell Burnell won for her 1967 discovery of the fast-spinning neutron stars known as pulsars, and for her five decades of scientific leadership after that epic find. Multi-messenger astronomy refers to the use of different types of information to probe the same cosmic object or phenomenon. 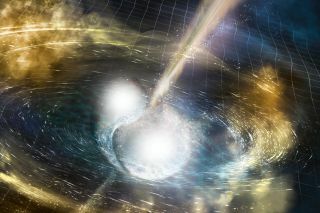 The field was born last year, when researchers observed the aftermath of an epic neutron-star collision via both electromagnetic radiation and gravitational waves, the ripples in space-time first predicted by Albert Einstein a century ago. Theoretical astrophysicist Brian Metzger of Columbia University started trying to work out what such a collision would look like nearly a decade ago. In 2010, he and his colleagues published a seminal paper that made several key predictions about mergers involving the densest objects in the universe — black holes and neutron stars. For example, the researchers wrote, a crash involving two neutron stars or a neutron star and a black hole will generate a blue glow if the collision creates heavy elements in significant quantities. And the overall emission from such a merger should be about 1,000 times brighter than a standard nova explosion (a flare-up from a white dwarf star in a two-star system). Indeed, Metzger and his team coined the term "kilonova" to refer to such an event. These predictions matched what was actually seen in the 2017 event — which is known as GW170817, because it was observed on Aug. 17, 2017 — "remarkably well," Metzger said. "It's really amazing when you come up with something theoretical and then see it play out in nature," he told Space.com. "There are relatively few times in astrophysics when things just pop out like that." Metzger won a $100,000 "New Horizons in Physics" Breakthrough Prize, an award reserved for early-career researchers, for this work. He said he was humbled by the recognition and stressed the collaborative nature of the overall effort, citing the teams whose observations of GW170817 validated his models. One of those teams was the LIGO Collaboration, the researchers who built and operate the Laser Interferometer Gravitational-Wave Observatory. LIGO and its European counterpart, Virgo, detected the gravitational waves emitted by GW170817. Three of the driving forces behind LIGO — Barry Barish, Kip Thorne and Rainer Weiss — received the 2017 Nobel Prize in physics. And three additional members of the LIGO team have now, like Metzger, been honored with a $100,000 New Horizons in Physics Breakthrough Prize. Those three researchers, who will share the award, are Rana Adhikari of the California Institute of Technology and Lisa Barsotti and Matthew Evans, both of the Massachusetts Institute of Technology (MIT). They are being recognized for "research on present and future ground-based detectors of gravitational waves," according to the Breakthrough Prize citation. Another $100,000 New Horizons in Physics Breakthrough Prize goes to Daniel Harlow, Daniel Jafferis and Aron Wall — of MIT, Harvard University and Stanford University, respectively — for "fundamental insights about quantum information, quantum field theory, and gravity." The above folks aren't the only awardees in this year's edition of the Breakthrough Prize in science and math, which was founded in 2012 by Mark Zuckerberg and Priscilla Chan, Sergey Brin, Anne Wojcicki and Yuri and Julia Milner. The 2019 Breakthrough Prize features seven $3 million awards — four in life sciences, two in fundamental physics (including the "Special Breakthrough" won by Bell Burnell) and one in mathematics. The six $100,000 "New Horizons" prizes and a $400,000 "Breakthrough Junior Prize" bring the total purse to $22 million. The winners will be honored Nov. 4 during a ceremony at NASA's Ames Research Center in Silicon Valley, California, that will be hosted by actor Pierce Brosnan. The $3 million awards are the richest in science. Each 2017 Nobel Prize, for comparison, was worth 9 million Swedish kronor — $1.01 million at current exchange rates.